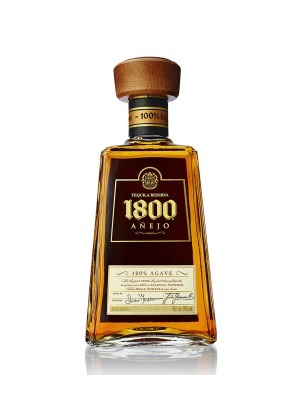 1800 Anejo Mexican Aged Tequila is a popular Tequlia available from DrinkSupermarket.com in 70cl to buy online. Visit DrinkSupermarket.com for the best price for 70cl of 1800 Anejo Mexican Aged Tequila or compare prices on our other Tequlia products. 1800 Tequila is named for the year that Tequilas were first put into oak casks to age. Produced in the Los Altos region of Jalisco, Mexico, 1800 Anejo is aged in French & American oak for up to 3 years. Caramel, vanilla & toasted coconut are the driving flavours here with a rich, smooth oaky finish. Definitely one to sip & savour! Where to buy 1800 Anejo Mexican Aged Tequila ? 1800 Anejo Mexican Aged Tequila Supermarkets & Stockists. You can buy 1800 Anejo Mexican Aged Tequila online in most retailers and find it in the Tequlia aisle in supermarkets but we found the best deals online for 1800 Anejo Mexican Aged Tequila in DrinkSupermarket.com, Amazon.co.uk, and others. Compare the current price of 1800 Anejo Mexican Aged Tequila in 70cl size in the table of offers below. Simply click on the button to order 1800 Anejo Mexican Aged Tequila online now.